As I posted about last week, Saturday the 13th was my diaversary. I went out to dinner with my parents, my brother, and my husband. We went to one of my favorite restaurants, and got cupcakes from my favorite cupcake place down the street. 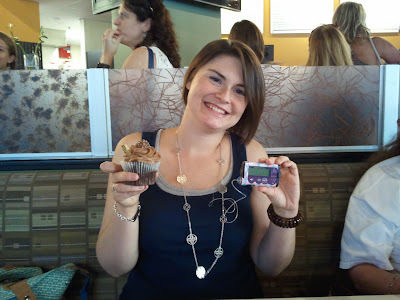 My cupcake was called Bella Nutella, and yes, it was actually made with Nutella. And it was amazing! As mixed as my emotions were that day, it was a wonderful celebration with my family. 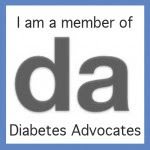 We talked about various things they remembered about my diagnosis and other moments from my life with diabetes. Or our life with diabetes. Because though I am the one with the disease, it affects all of them. My dad was in tears thinking back to my seizures. My mom just kept reaching over to hug me. My little brother remembers running to hide under the kitchen table when it was time for my shots after I was first diagnosed. True story. I would sit in my chair at the kitchen table, injecting my insulin, and he would be hiding under the same table, both watching and hiding. Oh, memories. I know they are all proud of me, and that is a nice feeling. The five of us (including Josh) have been through a lot together. And I loved having them all with me, celebrating the fact that I have diabetes, it does not have me. I love your last line. I love cupcakes as well, posted about my favorite cupcake place on my blog www.grammiescreations.blogspot.com My 1 year diaversary will be 2/2/12 and I'm trying to decide how to "celebrate" it, cupcakes sound really good, but so does a huge plate of spaghetti and garlic bread. How great is your family? You so very blessed Jess! Here's to many more years of diabetes NOT having you! Oh yum, cupcakes for breakfast!